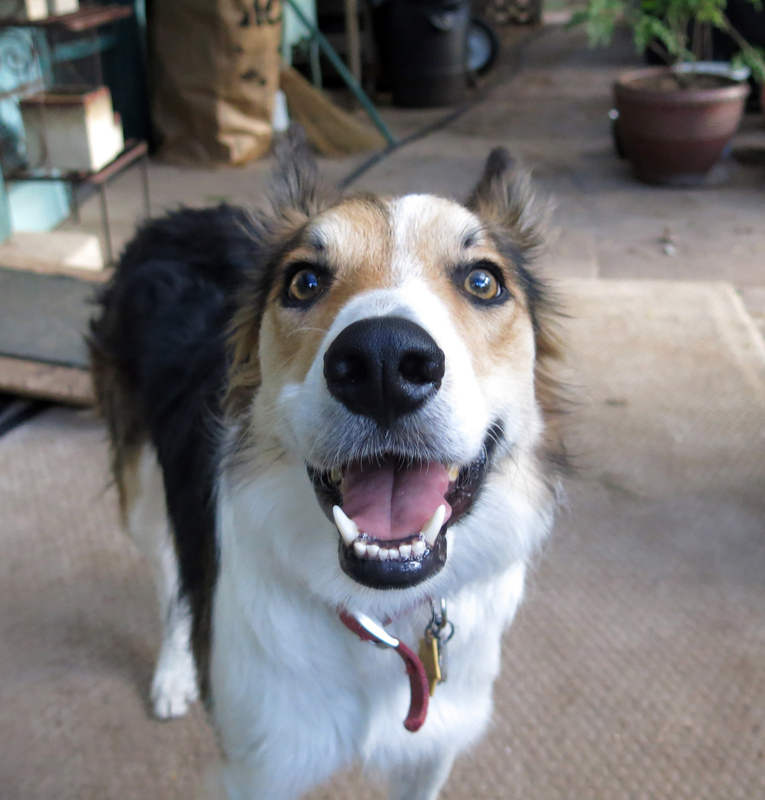 Greetings and salutations, everyone; yes, once again it is I, Mani the purebred border collie, filling in for the guy I live with, and here to bring you the latest news from our garden. You may remember me from such posts as “The Fast Learner”, among so many, many others. Here I am in a characteristic pose. Things here have been pretty boring, except for the day I got to go to Day Care, and also the day that I got to go to Guanella Pass. I’ve never been on a day trip before and the guy I live with’s friend suggested that I go, too. It was such a relief to go someplace cool. It was really chilly, misty, dark, and totally great. Those mountains are high. Mount Evans is behind these. This is looking east, by the way. 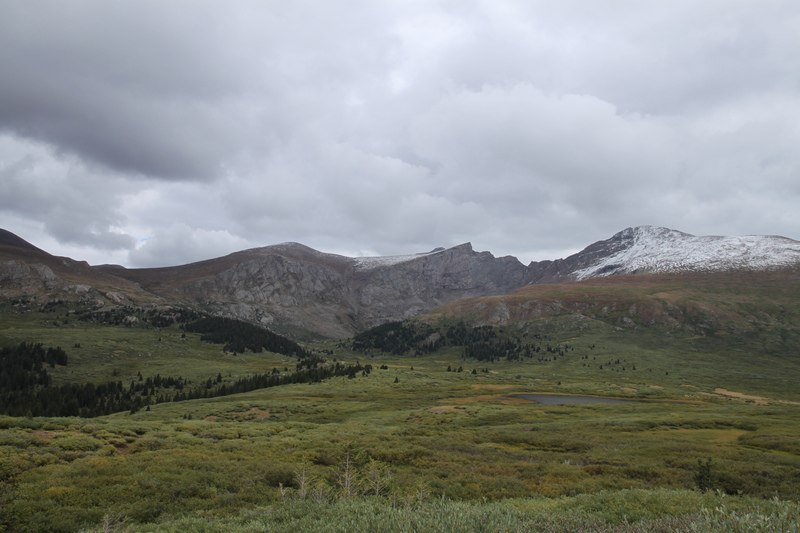 The one on the right, with snow on it, is Mount Bierstadt (named for the painter), 14,060 feet high (4,287 meters). We wandered around on the trails, and there was a lot of sniffing to do. I did all the sniffing, if you were wondering. It was so, so nice to get away from all the hot weather here. The guy I live with said we couldn’t move up to Guanella Pass, because it gets cold in the winter, and super extra-windy. And this is where all the thunder and lightning is born. When I heard that part, I decided that being roasting hot every day can’t be all that bad. I guess it will cool off here, eventually. When we got home there was some thunder, but it didn’t rain. I have a place to go when it thunders, now that I’m afraid of thunder. (It was that strike close to the house that did it, for me.) There hasn’t been much going on, except for a whole lot of complaining about the lack of rain. 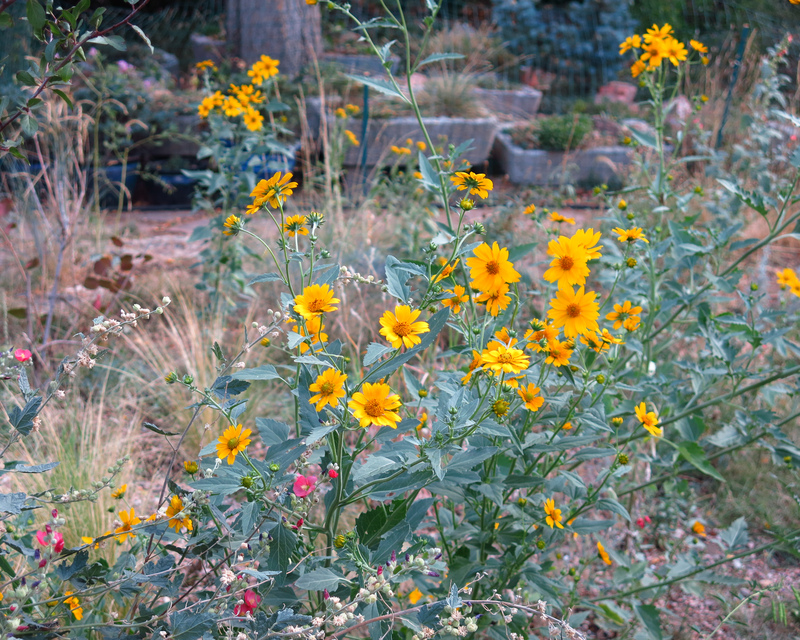 It isn’t like it rains here very much as it is, but the guy I live with says the garden could use a good, soaking rain. The guy I live with decided to do some watering. The cow-pen daisies perked up right away. It’s not supposed to rain any time in the near future. “Maybe never”, says you know who, the eternal optimist. There were supposed to be “zillions” of these flowering now, but there are only a lot of them. The guy I live with says that every year, at this time of year, he wishes there were more of certain plants, like these daisies, and asters, and stuff, and says he’ll remember to order plants and seeds next spring, and then when the spring comes, guess what he forgets to do? 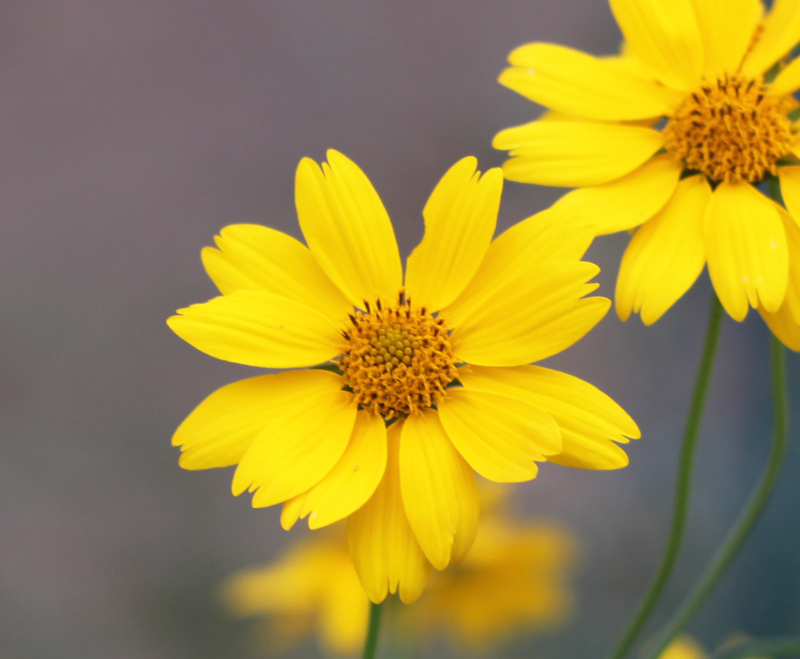 The cow-pen daisy is an annual, and easy from seed. It gets pretty big if it has some water. You can get seed from Plants of the Southwest, I hear. 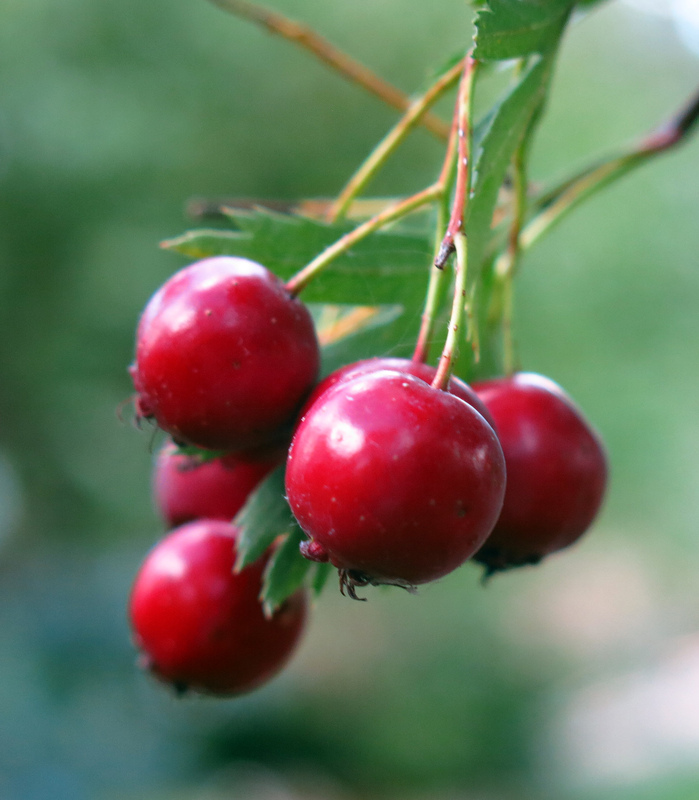 The squirrels are eating the haws on the Russian hawthorn (Crataegus ambigua), and so that display is being spoiled. I’ve tried the haws and they’re pretty good, so I can’t blame the squirrels for eating them, though squirrels are pretty annoying. The guy I live with says that the purebred border collies who lived here before me, Slipper and Chess, would also graze on the haws that fell onto the rock garden. So I bring some continuity to his life. I have been going on my evening walks again, because it isn’t thundering much in the evenings now, though there were firecrackers last night. If you remember the post from last year, we walked down by where the tiny native marigolds (Dyssodia papposa) are growing; they’re not much to look at, but they do have a strong marigold smell, which is kind of interesting. I guess I don’t have anything else for today. What a gorgeous dog you look — travel must enliven you. All the photos in this post are lovely, the composition, and especially the light, worthy of painter Bierstadt himself. The haws are made to appear so succulent that Adam could not have resisted. Was this your first jaunt away from home? I’m sure your behavior was exemplary enough to allow you to experience further travel and wider sniffing opportunities. It’s a big world out there, Mani, but sometimes one’s crate is best. Thanks; yes, it was my first time out, besides going to Day Care. I was hitched in, with my Roadie, so the windows could be down in back and I could look out, and stick my nose out into the chilly high-mountain air. The guy I live with was pretty disappointed when I became afraid of thunder. 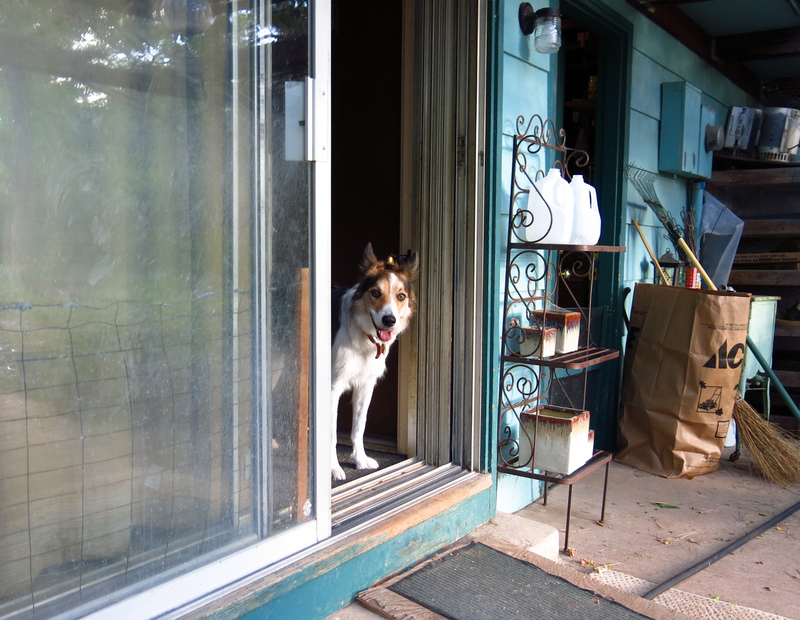 It was because of that super-loud lightning strike, which neighbors say was just north of the canal road, and then the next day, on my evening walk, there were firecrackers, and so that settled it for me. 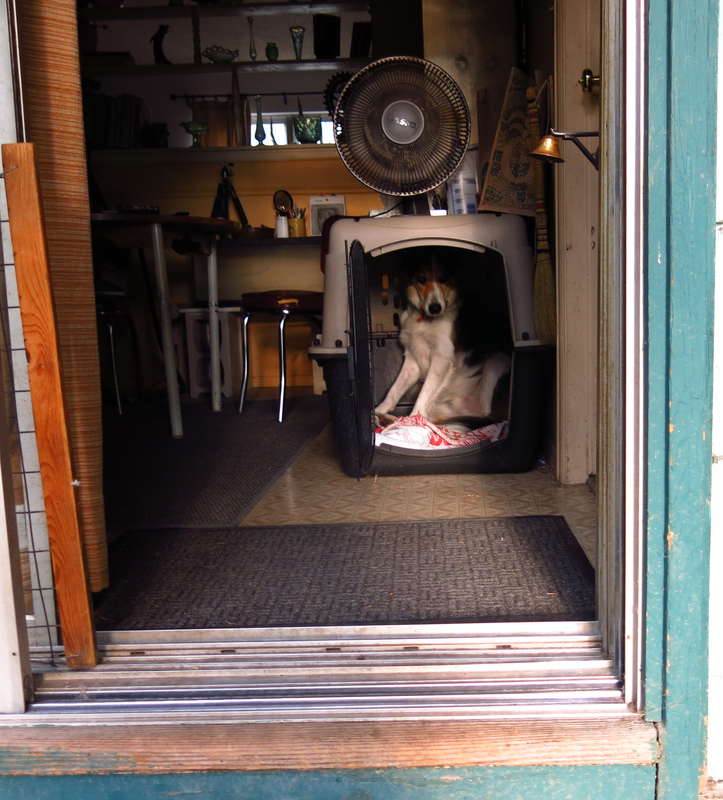 But then he realized that all of the purebred border collies who have lived here have been afraid of thunder, and so there was more of that continuity, you know. Oh, there’s a firecracker right now ….I’d better go. Elegant report, Mani … as always. We loved Guanella all those years ago. Best wishes from a warm and damp East Lancashire. Thanks. The road is paved now. Everyone was all the way people get when they heard the road was going to be paved, but it was nice. There was even a guard rail on the part that the guy I live with said used to be a “ledge road”, which, when he described it, sounded scary, but I hear there are worse ledge roads to go over. I might be against that. “Damp” sounds very nice to us, right now. That day trip must have agreed with you Mani – you look very happy in that first photo. Thanks. Actually I was wondering why the guy I live with had a biscuit on his head ….. I wish I could go to Mt. Evans right now, too. But it is cooling off here, so it wouldn’t be as big of a relief as it could have been. Dissing Dyssodias? Unheard of. I quite like them. The dyssodias are kind of unnoticeable here, because they get walked on, by people walking over them. But the scent is pleasant. It is nice to be less than constantly roasting hot, for sure. Glad you got to go on the excursion! Thanks; it was pretty great. Cool and misty, that’s the weather for me. Unfortunately, down here in the “lowlands”, it’s not so cool.